Fitter and Faster was proud to team up with Energy Core Swimming to raise money for swim families in Houston, TX who were displaced by Hurricane Harvey. Olympians Cammile Adams and Allison Schmidt were joined by Cammile’s twin sister Ashley Adams to run a special session of clinics in which 100% of all registration revenue for this special clinic was donated to the effort. In total, $5,025 was raised. 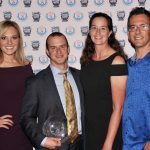 SwimSwam.com helped us spread the word. @cammileadams and @arschmitty in Houston holding a fundraiser to help swimmers who are displaced from hurricane flooding. The swim community is the BEST community! @cammileadams and her daughtercat, Jada, are busy receiving donated swim equipment for displaced swimmers in Houston. Thanks @swimoutlet for the awesome @liveinsporti brand donations! We can't wait to open the boxes!